Your hunch was right, it is the Adriatic! Abbazia is the Italian (and Hungarian) name for Opatija, a resort lying on the Gulf of Kvarner (Quarnero). It’s in Croatia now, but in 1939 the region was a part of Italy (it was ceded to Yugoslavia after World War II). Until the end of WWI, Abazzia had been in the Austro-Hungarian Empire. It was a stylish resort and very popular among Hungarians – even in the interwar period. Nowadays it’s known for its old-world charm. It’s beautiful! I would never have guessed. It is one of those small things that gnaw on your mind. It’s a great relief to have the answer. 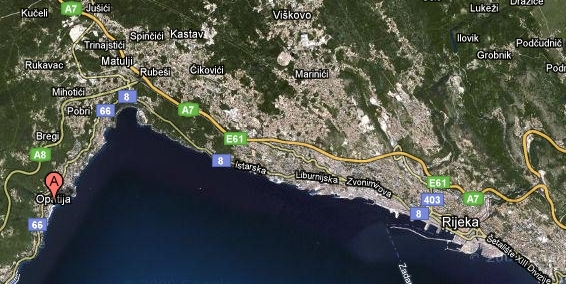 Just did some map reading: Opatija looks like it is near what used to be Fiume which I think is now Rijeka. Is that right? Yes, that’s right. 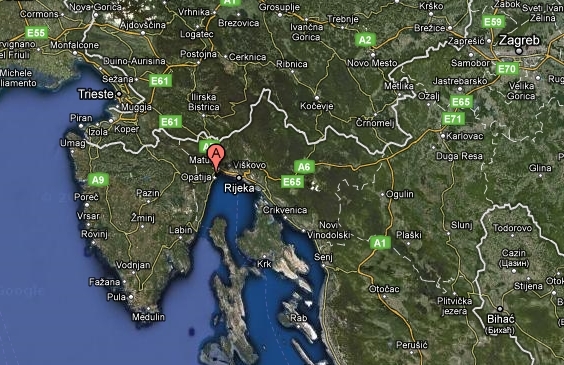 As you doubtless know, at the time of the Austro-Hungarian Empire, Fiume (Rijeka) was Hungary’s main port. The rail connection from Budapest to Fiume was excellent, and the tourists then went on to Abbazia (which actually lay in the Austrian half of the Empire, the border was just between the two places). Of course, between the two world wars the area belonged to Italy, but I imagine the rail connection from Budapest was still a direct one. Nowadays you have to change trains in Zagreb!!! 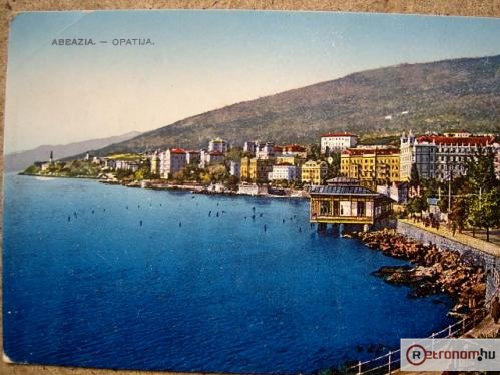 I also have some old postcards from Abbazia (Opatija). I’ve spent several vacations just south of the resort, in a place called Moscenicka Draga. It’s a beautiful coast (it’s called the Liburnia Riviera), with pebble beaches, crystal-clear water, and a steep wooded mountain (Ucka, or Monte Maggiore) behind you. I very much enjoyed reading about Erno. Trieste is towards the upper left, Abbazia (Opatija) is the tagged place and Rijeka (Fiume) is a little below and right of Opatija. Venice is around the bend on the upper left, south and west of this view. After World War I Trieste was given to Italy (one of the Allied powers during the war) and Fiume was given to Croatia as part of the newly formed Yugoslavia. Almost noone was happy about this arangement. Gabriele D’Annunzio led a famous attempt to capture Fiume for Italy in 1919 and Hungary was bitter over its loss. 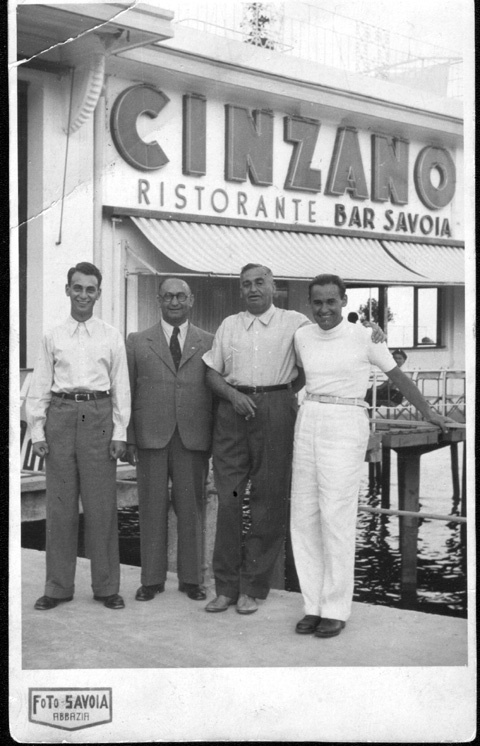 (My other grandfather, even after the second World War fumed over the loss of Fiume (pun intended)).